Where is Bihar? Up (from South everything is up). Who is the CM? No idea. What is the language there? No idea. What are the main attractions there? No idea. What do they eat? Litti choka, Sattu ka paratha, rice, roti, dal, aloo bhujia….etc etc etc. Yes, that’s the only thing I know about the Indian states now. Their food. At the moment, I can’t think of a single thing from Bihar other than their sattu or litti chhoka. Anyway, litti chhoka is apparently eaten for dinner and I was looking for a lunch menu. So, again, another neighbour of mine came to the rescue and this menu was suggested by her, depending on my pantry supplies. The menu here does not have the signature dishes of Bihar, but this is what people eat there on a regular basis – dal, roti, sabzi, chawal. The only aloo bhujia I have come across is the Haldi ram packed foods variety. So this very simple very basic aloo bhujia recipe was an eye opener. The only spices there in the dish are turmeric powder and salt. Yeah, you heard me right. How can we leave out Sattu when talking about Bihar? I had ruled out Sattu ka paratha and litti chhoka, but Sattu ka bharta (called Sattu ka masala as well) came to the rescue. All you need to do is to make your sattu flour, add a bit of oil, chopped onions and red chillies. I improvised this by adding a little left over oil (the oil that floats on top in pickle jars) from my MIL’s avakka pickle. So it’s essentially pickle oil that’s gone into the dish. To spice up the meal, add a spoon of sattu ka bharta while having rice and dal. The taste was really great. Aloo mattar is for the roti in the thali. But it pairs well with rice and dal as well. Again, a very simple easy preparation, but it tasted really heavenly. This kind of aloo mattar (home made) puts the restaurant style ones to shame, because it’s easy to prepare and it is light on stomach as well. The dal here is a mix of three kinds. 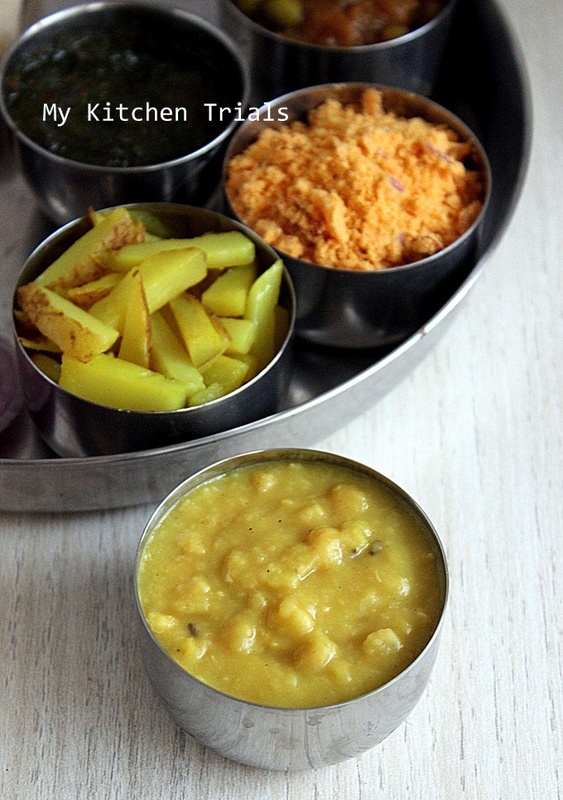 Chana dal, toor dal and masoor dal are cooked together. Only haldi and salt are added to it. Like the rest of the dishes, it’s easy to prepare and hardly spicy. Can you see the pudina chutney in the middle? Now that one is fiery. The sattu ka bharta(because of the pickle oil and the red chillies) and the pudina chutney are spicy enough to balance the meal. Raw chopped onion salad is also part of the meal. Daal : Pressure cook a mix of chana dal, masoor dal and toor dal in 1:1:1 proportion. I used 1/3rd cup each. Heat ghee in a pan, add jeera seeds. Once it crackles, add the cooked dals. Add half a tsp of turmeric powder and salt and let it boil for 3-4 minutes. If it’s too thick, add water and boil for some more time. Done! 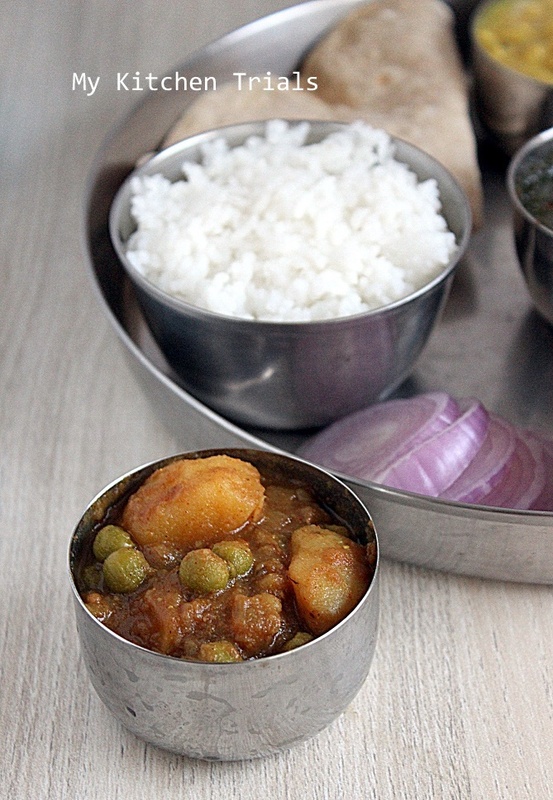 Aloo Mattar Curry : Saute one chopped onion with a spoon of ginger garlic paste. Make a paste of 1 tsp red chilli powder, 1/2 tsp turmeric powder, 1 tsp coriander powder, 1 tspcumin powder with 2-3 tbsp water. Add to the onions and cook for a couple of minutes. Add 1 cup water. Add cooked potatoes(2 big) and peas(1/2 cup). Add one chopped tomato and salt. Cover and boil for 5-10 minutes or until done. Taste test, adjust seasoning and also add more water if it turns out to be too thick. Add handful of chopped coriander leaves, 1 tsp garam masala. Take off the heat. The more this curry simmers in low heat, the tastier it is. Pudina Chutney : Grind a bunch of pudina leaves, 1 small onion, 2-3 green chillies (or per taste) and salt. Add lemon juice finally to retain colour. Sattu ka bharta/Sattu ka masala : Powder half cup fried gram(pottu kadalai) in a mixie. Add 2-3 tsp mustard oil (i used pickle oil), 1-2 minced red chillies, handful of minced onions. The oil should make the sattu a bit wet, but it shouldn’t make it soggy. So adjust the quantity accordingly. nicely clicked.. loved the aloo gravy. Rajani you rock man! !..loved the simple thali.We make the aaloo mattar and the chutney in the similar manner, but the sattu ka bharta is new to me..very interesting! !, will give it a shot . 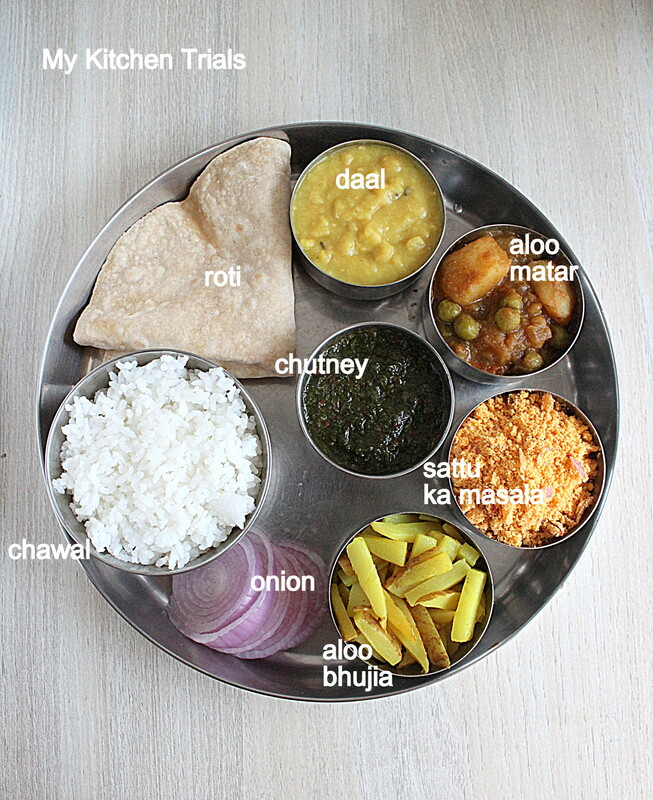 Simple thali, no re its really a huge thali for me, looking on ur aloo bhujia am drooling here. Rajani, you are simply amazing.. All these thalis you are churning out look so well thought out and absolutely delicious. 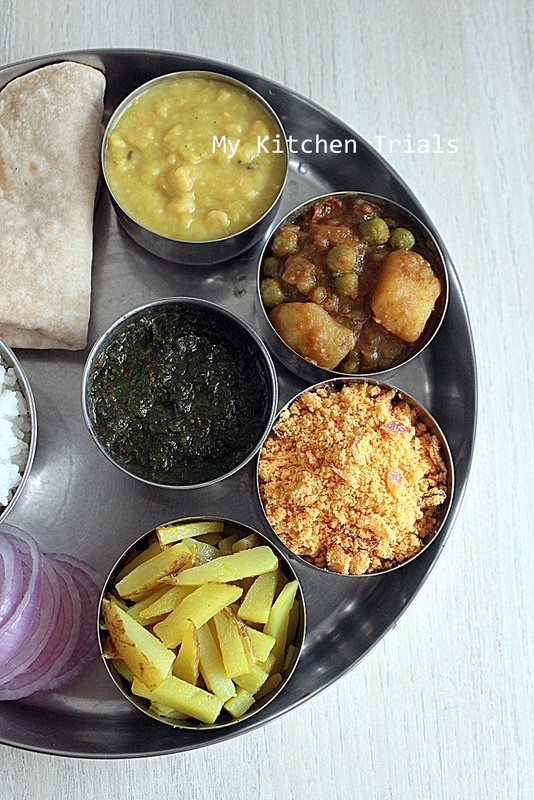 Bihari thali looks comforting & filling. Nothing elaborate, very simple yet you showcased the essence of Bihari food. Loved your thali. Comforting Thali,looks so delicious and tempting..Sattu ka bharha is something quiet interesting and the aloo mata rcurry is so inviting..
Love the simple everyday thali. I invite myself to your place.. Delicious lunch!! hahah..missed your wit Rajani..you got me cracking..:)..and your simple thali looks amazing..
ha ha, everything is up from south!! :) thanks to BM atleast i m learning what rest of India eat!!! Love that simple thali and sattu ka bharta is tempting good!! Wow.. It’s a spread of deliciousness. Yum.